Six days ago, Adam Brown, T1D and senior editor of diatribe, sent out a call to the Diabetes Online Community – to encourage people with diabetes to take a 5 minute survey. The survey results will go directly to the FDA and inform a groundbreaking patient=led discussion with the FDA November 3. The event will include patients, both with type 1 and 2, representatives from the American Diabetes Association, JDRF and diaTribe. Presented, will be the numerous challenges we face every day – that’s what will be captured in the survey. Those insights will then be shared directly with the FDA. Help us tell the FDA what matters to us and what we need, including what the biggest barriers to diabetes management are. This truly is an event where your voice will be heard and will count. Immediately, numerous patient advocates in the DOC took up the cause to spread the word. Here’s a quick from the heart video appeal from fellow advocate Manny Hernandez. For those of you who use a Continuous Glucose Monitor, or think you’d like to, here’s an excerpt from Dr. Anne Peter’s review of Dexcom’s newly available fourth generation, the G4, and MiniMed’s CGM, Enlite, which will be available in the Spring. Dr. Peters is an extremely respected endocrinologist, well known in the diabetes community, who practices at the Keck School of Medicine of the University of Southern California in Los Angeles. I love that Peters wears the sensors, although she doesn’t have diabetes, to understand what it’s like for patients. With all their advantages, one thing she finds burdens patients is the devices many alarms. Funny, we think of the benefit, alerting us to low and high blood sugar, but not the annoyance factor – I guess unless you wear one, I do not. Excerpt: With Dexcom G4 continuous glucose monitoring, the patient can easily insert the sensor under the skin — …on the abdomen or the back of the arm. A small transmitter is then placed on top of the sensor. The transmitter sends the interstitial glucose value to the device so the patient can see the blood sugar level. It transmits this information wirelessly every 5 minutes, so a patient can get a sense of whether their blood sugars are going up, going down, or staying the same. …the new Dexcom G4 is somewhat smaller [than the earlier-generation device]. It is not as wide, similar to an iPhone, and is easy to put in your pocket. It has a pretty good range so that you can be moving around in your house and the signal will still reach the device. A blood sugar level that is 100 mg/dL and is going up may require much different treatment from a blood sugar level of 100 mg/dL that is flat and the patient might be just fine. Or, if a blood sugar level is falling fast, it may mean that the patient needs to ingest carbohydrate to avoid a low. The patient can get a lot of information in real time from this device. Then, in my office, I download the device and interpret the data for the patient so I can help the patient analyze the data retrospectively, so that in real time patients can make more reasonable choices. …we also have the new MiniMed continuous glucose monitor, the Enlite™ sensor, which is supposed to be available in the spring. This is similarly inserted under the skin and taped down. In most cases, this device is talking to the patient’s insulin pump. The insulin pump has the tubing necessary to give the patient insulin, but now this pump also becomes the receiver for the signals from the sensor. The patient can look at the pump and see what the blood sugar levels are doing. A lot of patients want the pump to automatically give insulin based on their blood sugar levels, but that is not what happens. This is truly a sensor, and the patient then needs to use the Bolus Wizard [calculator] to interact with the pump to calculate the insulin dose. 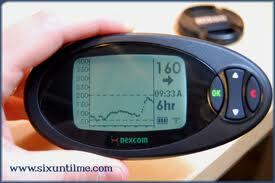 That coupling of the sensor and pump is part of the development of the artificial pancreas. Substantial research is being done to make pumps that can use continuous glucose monitoring data so that the patient does not have to think as much about diabetes management. [Those advances] are in the future. For now we have sensors that sense interstitial fluid, giving continuous real-time data, and we have pumps that patients interact with to give themselves insulin. You can couple the MiniMed sensor with the MiniMed pump. The Dexcom device does not interact with a pump, although the manufacturer is working on collaborations with some pump manufacturers. For a couple of years now [yes, takes me a long time to weigh things ;-)] I have silently urged Apidra to come up with an insulin pen that allows me to dose half a unit. Each time I saw a rep at a health fair, I’d ask whether this was in the works. Most looked at me with amazement, “You want to be able to take a half unit?” they decried? Yes I do. Eating a low carb diet and power-walking an hour a day, I often only need a half unit to dose for a meal of, for instance, veggies and chicken or fish (Please DO NOT take my dosing for yours, we each have individual needs). As you can sort of see in the post below, I use the Lantus Solostar pen for my long-acting insulin and wondered about having the same ease for my meal time insulin. Tis true, after 40 years with type 1 diabetes, I may be ready to give up my vial and syringe. Like most people I find an insulin pen easier to use than the few extra steps vial and syringe requires, and prefer the non-medical-ness of it all. Maybe even more, since I use so little rapid-acting insulin, when I have to throw the bottle out after a month, I’m throwing away four-fifths of it. That waste makes me crazy each month. But Apidra told me if they come out with a pen that would dose half a unit it wouldn’t be before 2014. So I found HumaPen LUXURA HD. HumaPen is the only pen that offers half a unit rapid-acting insulin. I checked with some diabetes educator friends who said Apidra, Humalog and Novolog (rapid-acting insulins) are all pretty similar, so I printed off my free coupon for the Humapen, called my doctor’s office to get a prescription for the pen cartridges and waited til my Apidra was up for the month. • It’s a solidly-made insulin device. • It’s rather gorgeous, especially for a medical device, in its Italian deep forest green color. Yet, having recently discovered I need to take the insulin cap off each time I dose, and put it (or a new one after a while) back on before the next shot, it feels as multi-step a procedure as sticking a syringe in a vial. And while the weight assures me of its state-of-the-art craftsmanship, it’s weightier in my purse than a vial and syringe. And, while that gorgeous green tube sticking out of my stomach for the 5 seconds I have to keep it there with my finger on the dose button to make sure I get my full dose, may perhaps be less discrete, considering a syringe is comparatively tiny and I jab it into my body, and out, in a second, it hardly seems so. So, far as I’m concerned right now the playing field is level: Pen: 3, Syringe: 3. I’ll give the HumaPen a run, but don’t know whether I’ll switch for good. Tip: For those of you on pens who wonder, as I did, whether the extra insulin you use to prime the pen takes away from the amount left in the pen for your dose, the answer is no. I spoke to a Lilly rep this morning who told me they overfill pens and insulin cartridges to cover those extra units used for priming. Two weeks ago I was invited, along with a handful of diabetes bloggers and advocates to Sanofi’s (third largest global pharmaceutical) corporate office in New Jersey on the eve of their launch of iBGStar. They secured FDA approval December of last year. If you haven’t heard of iBGStar, it’s a new blood glucose meter that plugs into an iPhone or iPod touch. Using the iBGStar Diabetes Manager App it’s the first meter to work as a mobile health device. Shawna Gvazdauskas, VP and Head of Diabetes Devices, for Sanofi U.S. brought us together along with 7 members of her team to see the iBGStar up close and personal. With the iBGStar (I is for iPhone, BG blood glucose and Star their new line of devices) and its App, patients can record, track, manage and share their data, anytime, anywhere. The premise being that you always have your phone with you. I don’t, but I seem to be a minority of one. The iBGStar captures blood glucose readings, records carbs and insulin doses, tags readings according to mealtimes and allows you to add customized notes about each meal or exercise. You can analyse the data using a logbook, trend chart and statistics. Color-coded screens indicate if blood glucose is too high or too low. You can of course show your doctor your handy, dandy phone, now turned into a mobile health device and/or email your results. The meter can be used on its own, without the iPhone or iPod touch. It is the width of an iPhone as you can see and less than 1 inch tall, light as a feather, has a 6 second countdown, uses 0.5 microliter blood size, one of the smallest amounts, and meets accuracy requirements. There’s no coding although that I would expect these days. Naturally, we all got to play with this nifty little device and walk away with one and 10 strips to see what we think. The only thing that bothered me was it consistently gives me a reading 20 plus points higher than the meter I’ve been using, the Bayer Contour. The thing is I don’t know which is more correct, and you should know, if you don’t, that meters are allowed to be 20% inaccurate. When I asked the question how does one know if the numbers you’re seeing are accurate, the response I got from a gentleman on the marketing team is it’s best to use one meter and get used to how it’s judging your blood sugar. That’s probably the right answer but less than satisfying. If you’re wondering what these little meters cost and where you can get one, they’re available at Apple and Walgreens retail stores and online at Apple’s online store and Walgreens.com. Apple charges $99.95 for the device along with 50 strips and Walgreens $74.95 with 10 strips. Sanofi offers a copay assistance card so strips will not cost more than $20/order. Sanofi also plans to integrate their GoMeals app with the iBGStar Diabetes Manager App. It will certainly be interesting to see what other “Star” devices are in the pipeline. Sanofi’s Shawna Gvazdauskas, Brian Dolan of mobile health news, me, Emily Coles, Laura Kolodjeski, Sanofi Senior Manager, Patient solutions, Allison Blass of DiabetesMine, Kim Vlasnik of Texting My Pancreas.com, Kerri Sparling of SixUntilMe.com, Adam Brown and Kelly Close of Close Concerns. Blogger Leighann Calentine of D-Mom and analyst David Kliff of Diabetic Investor attended the meeting but had to leave before the photo was taken. I mentioned meeting the Timesulin people when I was at the IDF World Congress in Dubai. I am truly happy with this little invention that I’ve been road-testing since. Now it’s left the production floor and is available in Europe. Yes, I know, everything seems to happen in Europe before here, but Timesulin are now talking with distributors and planning for the cap to be available in the U.S. this summer. Just so you’re ready when it’s available, here’s a little preview. Ever wonder whether you took your injection? Now you’ll know. Place the cap on your insulin pen (there are caps that go with each insulin pen on the market) and it begins counting. 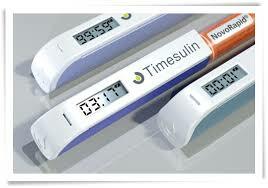 Look at your pen cap minutes later, or hours later, and you’ll see when you took your injection. Once you take the cap off, after 8 seconds it resets to zero. The cap will last about a year before it needs replacing. In using it, not only did I like the knowledge that I had taken my shot, but it kept me more regular in doing it every 24 hours since I can take my Lantus without thinking much did I take it at 8 AM yesterday or 9 AM? I’m equally impressed by the Timesulin group. It’s family – a few brothers, one wife and a friend or two. All of them smart. All of them devoted and committed. And of course it all began because co-founder and CEO, John Sjolund, has had type 1 diabetes since the age of three and an over-active mind. I couldn’t agree more. Simple? You bet. There’s no big booklet to read when you take it out of the box. No charger to plug in. Just take off your pen’s cap, pop this one on and you’re off and running. Effective? You bet. It keeps you regular without the Metamucil. My Dexcom 7 CGM and I have had nine days and nights together and we’ve parted ways. And, as if it knew I was not happy with it, it gave me one last kick in the teeth coughing up its last numbers. I met a friend today for brunch in Manhattan. I walked from my apartment in Brooklyn over the Brooklyn bridge and then took a subway to the cute little Italian bistro where we were meeting. The walk took about 90 minutes. After being seated and looking at the restaurant menu I took out my meter and tested. I was “80.” I took the CGM receiver out of my pocket. I was “80.” Unbelievable! This is the first time since CDE/Pump Trainer, Gary Scheiner, slapped the sensor pod on me last week in Philadelphia – and I carried it across state lines – that both showed the same number. Two hours later after a fairly low carb lunch my friend and I were strolling around and the CGM read “180.” Hmm…I thought, well I did have a few roasted potato pieces and a half a plain cookie the waiter brought along with the bill, maybe I need another half unit, so I took it. Then my friend and I spied a new concept yogurt store where you make your own frozen yogurt and toppings so of course we had to go in and see. And we had to put that tiny paper sample cup under the raspberry and peanut butter yogurt. Now walking back to my friend’s car I reached into my pocket to see what number was on the CGM. It said “222.” Hmmm…well I had just had what was probably a quarter cup of frozen yogurt, guess I need another 1/2 unit, which I took. Sitting on the subway platform 15 minutes later waiting for my train home a thought came barreling through my head…hmmm…”222″ … I’m hardly ever over 200. Let’s see what my meter says. My meter said, “108.” My meter also said, “What the hell are you doing dosing off your CGM!!! You know better than that!! !” Surely I do, but I had forgotten in the romantic glow of that “80” when the CGM won my heart back at lunch. I so wanted to be in love with my CGM just like the many people I’ve talked to are with theirs. I pulled the CGM display out of my pocket and went to enter the “108” to calibrate it and it gave me an error reading. It actually said, “ERR” which is just how I felt, especially if you add a few exclamation marks, “ERR!! !.” When I got home a half hour later, I looked through the booklet and saw my sensor was done, and it had had the last laugh all the way to its untimely end. A CGM? Not for me. Not until its accuracy is twice what it was for me. About 50% of the time it was tracking 10 – 20 points apart from my meter, the rest of the time it was anywhere from 20+ to 75 points away. It alarmed me telling me I was “53” when my meter said “85” and it fooled me into trusting it so many times. I wanted to love you CGM, truly I did. But I’m going to wait til another generation or two comes along. Until a CGM is really ready to love me back. For now I’m sticking to finger sticks, and running for the juice! I admit it – I use my ipad mostly to get and return emails when I’m on the road. 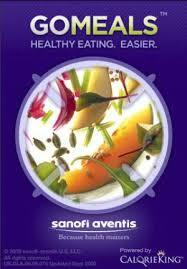 But recently, while speaking in Bangor Maine, I saw a card on a vendor table for the GoMeals app by sanofi aventis. So I downloaded it. And I tried it. And I was impressed. It’s easy to use and has a ton of information. To be exact, it stores a database of over 25,000 generic and brand food items and 20,000 restaurant menu foods. It even had my Trader Joe soup. GoMeals can help you create a meal, adding up your calories, carbs and fat grams as you place foods on your virtual plate. You can save your favorite meals, keep a food log and locate local restaurants. Where would you be without your meter? Speak out, change lives. Me? I’d be back like Journeyman to the world I lived in 25 years ago, never knowing what my blood sugar was, hopelessly trying to eat the same stuff every day and blithely thinking 200+ blood sugars was “doing well.” Pffff! How times have changed. Now let’s change them again — for all diabetics! As we count down to Diabetes Day, tomorrow, I’ve been asked among the diabetes blogging community, to have your voice heard to get more health insurance coverage for the very things that keep us going with diabetes: Diabetes Technology — meters, pumps and continuous glucose monitors — as well as the education how to use these. Here’s your chance to add your voice to the rising chorus of “yea-sayers.” Just fill out this survey and you’ll be helping to turn the tide, http://www.surveymonkey.com/s.aspx?sm=CeG1e2pg7dS0ajPv26na9g_3d_3d. You’ll be changing a life. For more information, see Amy Tenderich’s article on her blog DiabetesMine: http://www.diabetesmine.com/2007/11/stand-up-for–1.html. I’m not in the habit of pitching products, except the ones I mysteriously find and love. But Marie found me, and loves the medic alert bands her company makes so much she wanted to share the news. So I checked them out, ID On Me, and want to pass along the word for those of you who may love them too. According to Marie, they’re “lightweight, stylish, great for kids and adults and only $12.” Combing their website I see they’re also waterproof and store, on paper in their little case, a wealth of information: your medical conditions, emergency contacts and family info — seems this is a particular advantage. So, there’s our little community. If you love something, let me know.